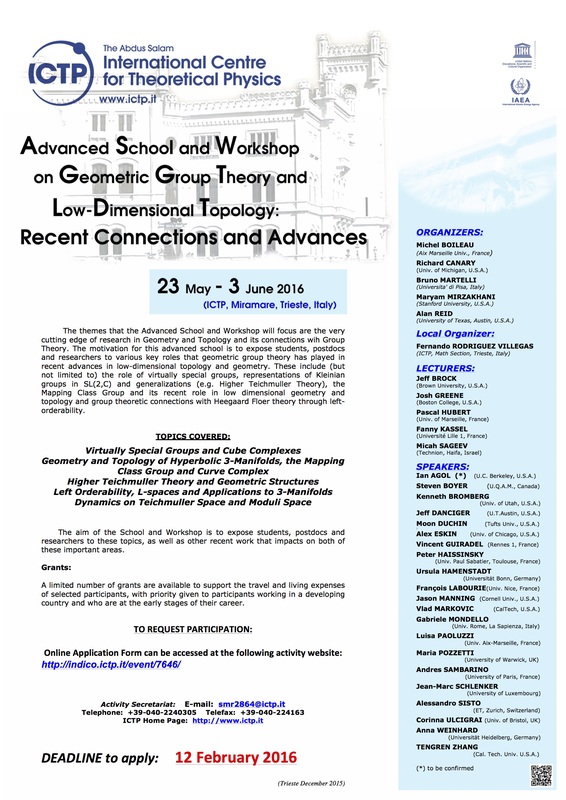 This advanced school and workshop will focus on themes at the cutting edge of research in geometry and topology and its connections with group theory. It will expose students, post docs, and researchers to various key roles that geometric group theory has played in recent advances in low-dimensional topology and geometry. These include, but are not limited to, the role of virtually special groups, representations of Kleinian groups in SL(2,C) and generalizations (e.g. Higher Teichmüller Theory), the mapping class group and its recent role in low dimensional geometry and topology and group theory connections with Heegaard Floer theory through left-orderability.